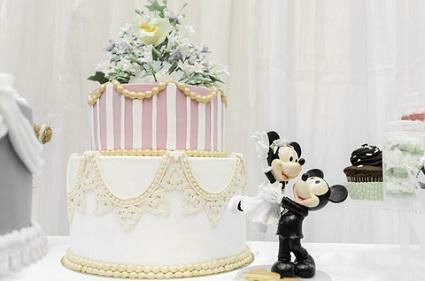 Mickey and Minnie wedding decorations can add playful romanticism to an otherwise formal occasion. Through America's pop culture, Mickey and Minnie have proven time and again to have the secret to a long-standing relationship. Utterly smitten with each other since the 1920s, many couples love to use Mickey and Minnie decorations to add a fun and sentimental feel to their nuptials. Many adults, especially those who grew up in California or Florida, have warm fuzzies in their hearts going back to family vacations to the Magic Kingdom. Mickey Mouse has long been a national symbol for childhood fantasies and simple happiness, so it's no wonder people choose to invite the world's most famous rodents to their big day. To make things even better, Disney has unleashed a wide assortment of Mickey and Minnie wedding decorations you can choose from. With the start of Disney Fairy Tale Weddings©, you can even bring your Mickey Mouse theme right to one of Disney's parks and have a completely moused out occasion! All of these are available on websites such as the Fairy Tale Wedding Store. You can also get them during wedding season at the Disney Store, or through booking a Disney Fairy Tale Wedding. If you are the ultimate Mickey fan, a Disney Fairy Tale Wedding may be your dream come true. For a little over $30K, you can have the ultimate Mickey decoration - the mouse himself along with his cherished Minnie decked out in formal attire at your ceremony or reception. However, if you are looking to spend money a little more conservatively, there are quite a few homemade options to make your wedding spectacular. Start by asking your bakery if they can whip up several batches of Mickey and Minnie cookies, and add each one to a place setting. If you have assigned seating, you can give Mickey cookies to the men, Minnie to the women, and smaller, bite-sized mouse ears to the children in attendance. Another way to add flair to a Mickey wedding without being over the top is to incorporate a slideshow of images into your ceremony. You can give this a distinct Disney theme with slides of our favorite mice in between each image of you and your spouse. As a bonus, if you have frequented Disneyland or Disney World on a semi-regular basis through the years, you can consider adding photos from those trips. Show the bride through the years, followed by the groom, and then you together as a couple for a popular and sentimental timeline your families will love. Do you or your fiancé have photos of yourselves with Mickey as a child at different ages? This would be a great addition to your big day. There are plenty of things you can do, including adding Mickey and Minnie wedding decorations, to mouse up your wedding and cause it to be a unique and memorable occasion for both you and your guests for years to come. Use a little creativity and some of that Disney magic for the ultimate Mickey Mouse nuptials.